‘Maexxna is a GIANT SPIDER!’ and so I don’t want her picture enlarged on my blog. I don’t like spiders. So this post has nothing to do with writing at all, but that’s hopefully alright because everyone needs a break now and then. I just wanted to talk about what’s been distracting me lately: Blizzard Entertainment‘s digital CCG Hearthstone. 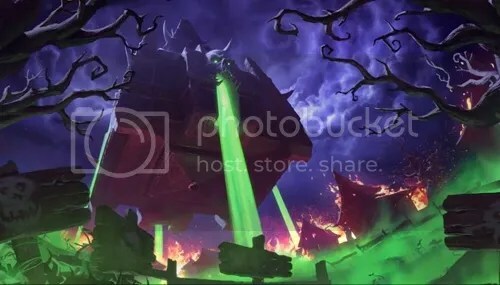 Those who care would know that on 22 July an expansion titled Curse of Naxrammus was released for it, and it features an array of single-player challenges which one can play to unlock new cards. The hardest difficulty of these has the AI being completely OP and cheating like a dissatisfied spouse playing Monopoly as the banker. Which is fine because it’s still, as a whole, stupid but the last opponent is something special that requires a rethink in deck-building. Spoilers for the Heroic Maexxna fight from here. If you want to experience it and figure out the strategy for it yourself, it may be best to avoid reading further. Let me set some context here: to add to my nerd portfolio, I had played Magic: the Gathering for more than 15 years so I like to think that I’m fairly good at card games. And indeed Heroic Anub’Rekhan was a close race but fairly straightforward. Heroic Grand Widow Faerlina took some time to stabilise but once you did it was fine. When I opened up Heroic Maexxna, though, and saw what she did I promptly burst out laughing. And then lost. Maexxna starts the game with two Haunted Creepers already in play. Her ability costs no mana and returns two random opposing minions to their controller’s hand. Thankfully it’s set to autocast and will be played at the very beginning of all her turns so she never tries to strategise with it. Otherwise her heroic deck doesn’t seem very different from her normal incarnation, save for her 45 starting life like all the heroic opponents. • It’s very cheap. No legendaries, no epics, and even the rares are rather optional. I don’t have a lot of cards myself. If you have an Alexstrasza feel free to include it for an easy win. In fact, use it against all heroic opponents. Alexstrasza laughs at their extra life padding. Now for an explanation of the philosophy. Generally speaking, Maexxna floods the board very quickly and combined with her ability it’s very difficult to wrest board control from her. So I gave up. Instead, let her fill the board with 1/x creatures. Once she has seven on the board she can no longer play any minions and doesn’t know what do with her life. The best she can do is wail at you for seven each turn, less if a Nerubian Egg somehow slips in there somewhere. The priority, then, is to 1) quickly fill Maexxna’s board with subpar creatures 2) find a way to mitigate the incoming damage each turn. Use your charge minions, Elven Archer and Shadow Word: Pain to destroy Haunted Creepers early to give Maexxna more 1/1 chumps. If a Sea Giant sneaks its way in there hopefully you’ll have Shadow Word: Death for it. Auchenai Soulpriest + Circle of Healing can also clear a board of 4x Haunted Creeper (Maexxna runs many copies of those) for an easy setup. After that, it’s time to abuse Maexxna’s hero ability with Voodoo Doctor, Earthen Ring Farseer and Priestess of Elune. A combination of two of those and/or your hero power will either keep your life stable to draw more or eventually start netting you life each turn. As the game goes long you’ll eventually get back up to 30 life and stay there; just survive until you get enough cards/mana to do it. The win condition: the deck has 24 points of direct spell damage which you can throw at Maexxna when you have spare mana. Earthen Ring Farseer + Voodoo Doctor + Hero Power + Mind Blast/Holy Smite or Holy Fire + Voodoo Doctor + Hero Power are both doable on 10 mana. That, combined with small bits of charge damage you can squeeze in now and then you’ll win eventually. Never risk playing more than two minions though. Eventually Maexxna will go to fatigue (and because she draws first, she’ll do it before you). You will be consistently higher on life because of your healing and Maexxna will die from decking. You can use Auchenai Soulpriest + your healing minions for a final burst of damage too. Because it’s relatively easy to win once you get set up don’t hesitate to use a Holy Smite on a Haunted Creeper if that will fill Maexxna’s board; doing so is a priority. The only thing you really have to watch out for is your hand size. Throw away cards as often as you can without disrupting the status quo i.e. silence worthless minions and suicide charge minions again Stoneskin Gargoyle if Maexxna has one. Once you’ve drawn enough healing minions and all the burn spells you want you won’t have to worry about it anymore. This strategy will also work for Warrior (with weapons for extra damage) and Paladin (with Guardian of Kings as a better Priestess of Elune, but a worthless hero power). Take care when playing weapons, because Maexxna does run Acidic Swamp Ooze; generally save them until her board is full. Druid will work too; Ancient of Lore + Voodoo Doctor + Hero Power will eventually kill Maexxna. Priest is still probably the most consistent option.